I learned a little something from Martha today. You start with a little wheatgrass. This is a great project to involve the kids in. Start with a cute pot and some soil. May I suggest these? 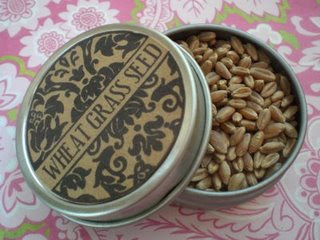 Plant your wheatgrass and watch it grow! This stuff grows so fast! 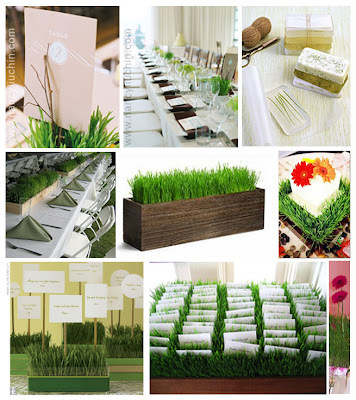 So many ways to decorate with wheatgrass for Spring! My kids have had so much fun growing our own grass for Easter. I got a little bag of seeds at a craft store for $1.29. We planted ours 2 days ago. You wouldn't believe how fast it takes off! And trust me, I do not have a green thumb! I think the idea of a "live" Easter basket, or "live" decoration in the home is very refreshing. I could really use more green right now...I am anxious for spring. THanks for the tip! I'll be heading to the store for this today! 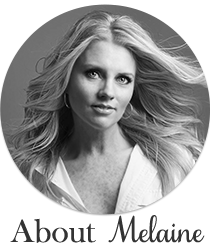 Hi Melaine - I have always planted my son's Easter baskets cuase I hate that plastic stuff. :-) If you have kitties, try growing catnip. It looks similiar and is also easy to grow. My son calls it catcrack b/c of the way the cat's react to it. LOL Rye grass is also a fast grower. 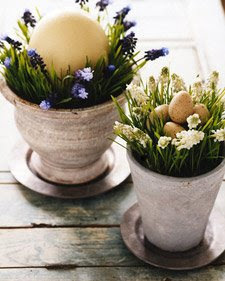 I am going to be blogging about a pretty centerpiece idea where you plant grass seed in a large white platter and fill with colored eggs and spring blossoms. Your new blog design is soooo pretty. I love all the changes!